Phrases are strings of text that are enclosed in quotation marks, resulting in a more restricted search. For example, a search for java programming looks for the words java and programming in and across fields; a search for "java programming" returns all records that contain the phrase java programming in single search fields. Want to capture an equation from an IEEE paper? Go to the full-text html version of the article and click on the View Source link below the equation. You can copy and paste the TeX source for the equation into a program with an equation editor. NOTE: When attempting to access many of our electronic resources from Off Campus, you will be prompted to login using your Widener ID card or Library Research Card. Use the barcode number located on the back of the card to login. 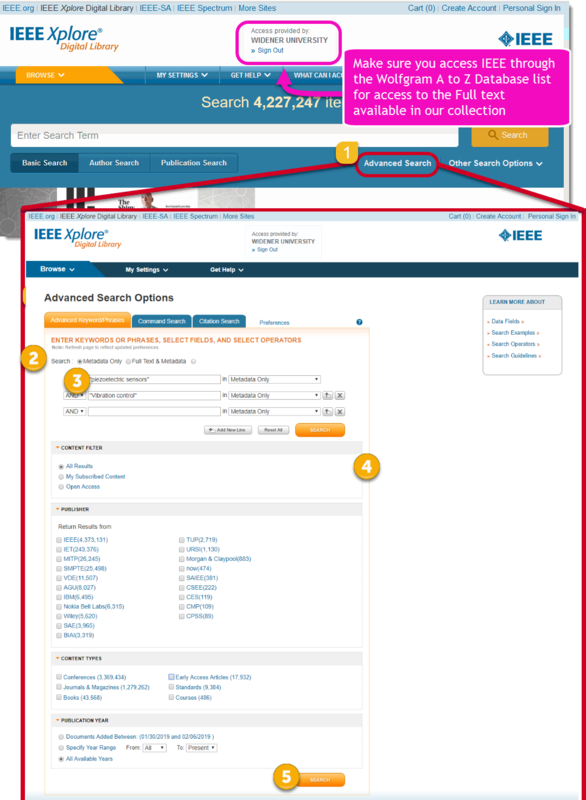 Be sure to access IEEE Xplore Digital Library through the Wolfgram A-Z Database, the ensures you have access the Full Text materials that we subscribe to. 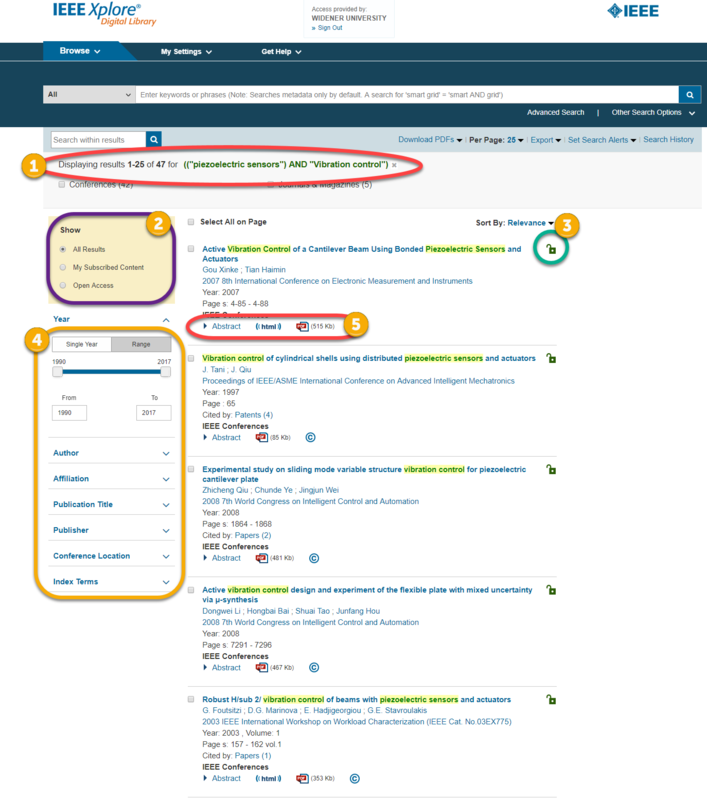 Decide if you want to search Metadata Only (Title, Authors, Subject Headings, Keywords, and Abstract) or Full Text and Metadata (This option would search the metadata, along with the Full Text of the articles, for your Search Terms/ Keywords). Enter Search Terms/Keywords. (The default is to AND words together. To search for a phrase, put words in quotation marks). In the example below, we used the Search Terms "piezoelectric sensors" and "vibration control". Notice we wrapped each in quotation marks to avoid the system searching for them as individual words. The search for "piezoelectric sensors" and "vibration control" provided 47 results. By selecting 'My Subscribed Content' or "All Results" you will see all of the content we have access to. A green open padlock icon indicates the Full Text is available for viewing/download. 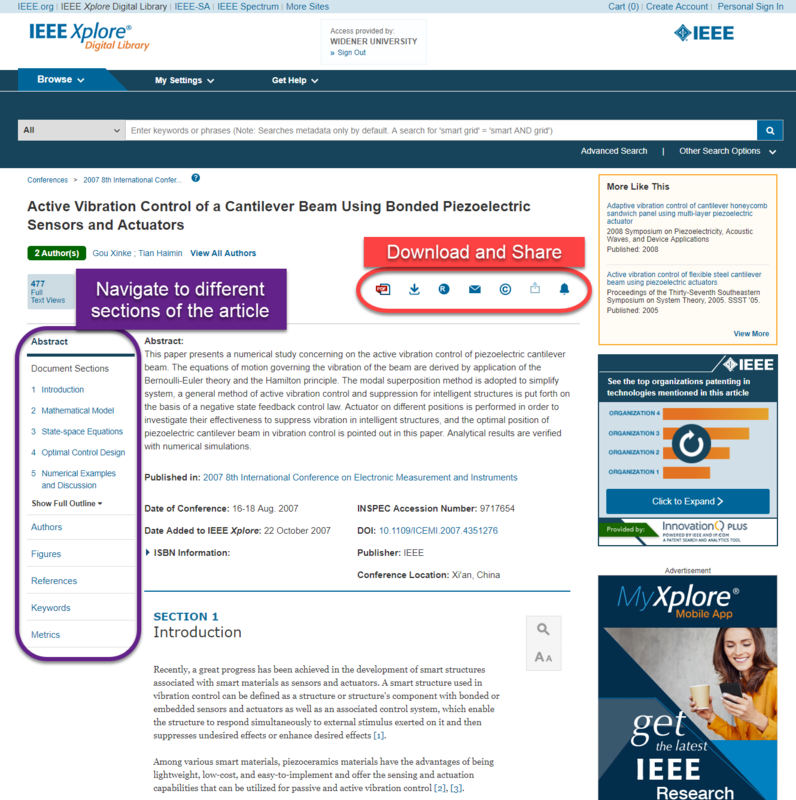 If a blue locked padlock icon is viable, it indicates that the article is NOT available in Full Text within this database. You are able to narrow your search results by year, author, publication, publisher, and more. Click direct links to view Abstract, HTML (view Full Text online), or PDF (download PDF for off line use). Scan and interpret articles in under 60 seconds using Quick Preview. Easily download hi-res versions of figures, graphics, and images. Quickly view and copy mathematical equations, expressions, and formulas. Navigate between sections of long articles with intuitive floating navigation.